September 2, 2013 /2 Comments/in Diabetes /by Jenn F.
Foot health and hygiene is important for everyone, but especially for people with diabetes. The longer you live with diabetes, the higher your risk of long-term complications. It is estimated that 15% of people with diabetes suffer from foot issues, which is one of the leading causes for hospitalization among these patients. Most diabetic foot issues begin with an undetected skin lesion. If left unchecked diabetes complications can lead to worst case medical conditions like amputation or even death. While the number of amputations and deaths have gone down in recent years, it’s still a cause for great concern because these extreme outcomes are often preventable. – Impaired Circulation – Impaired circulation in the legs and feet makes wound healing difficult, thus opening the body up to infection. – Peripheral Neuropathy – The loss of nerve function in the legs and feet, impairs a person’s ability to feel pain from injury, so infected wounds are often discovered too late. – Ulcers – A break in the skin that penetrates to deeper layers of tissue is called an ulcer. These wounds can take a long time to heal and may become infected. Ulcers are one of the main causes of diabetic foot amputations. – Gangrene – Gangrene (the rotting of the tissue) can occur in the foot as a result of infection, injury, or diabetes complications. High blood sugar levels damage the nerves and blood vessels. The diminished blood flow and circulation causes the tissue to die off from lack of oxygen and nutrients. Gangrene is another common reason for amputation. – Athlete’s Foot Fungus & Toenail Fungus – Many diabetics unfortunately suffer from foot fungus and toenail fungus. These conditions are uncomfortable for anyone, but they may take longer to resolve in people with diabetes due to the slow wound healing and lowered natural defenses. 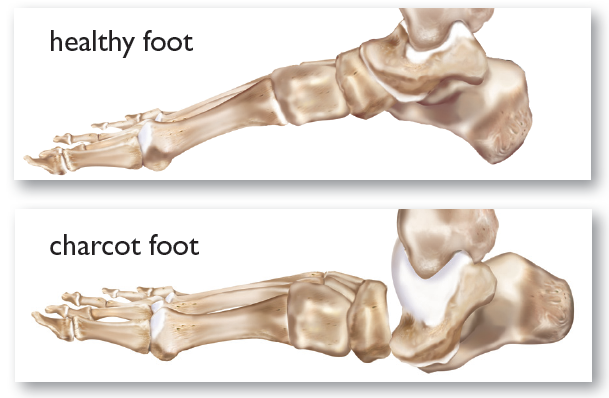 – Charcot Foot – Though rare (occurring in just 2.5% of the diabetic population) — charcot foot is a nightmarish condition where the bones of the foot collapse upon themselves, resulting in deformity. Due to neuropathy, patients often do not feel the bones and joints shifting until they have trouble walking and require amputation. Death Risks Increase Following Amputation. Perhaps it’s disheartening to find out a limb must be cut off. Or perhaps amputation happens to be one of the late stage diabetes complications. For whatever reason, 74% of diabetics who need a foot amputation will die within five years, according to a study published in the Journal of the American Podiatric Medical Association. Given this ominous prognosis, it’s logical to take every possible precaution against amputation. Diabetics should inspect their feet daily to make sure there are no blisters, ulcers or other injuries. They should always wear shoes or slippers and avoid walking barefoot. Visits to a podiatrist should be a regularly scheduled activity. Nail care professionals should make sure there are not ingrown toenails. Exposure to foot fungus and bacteria should be limited through regular washing and the use of a SteriShoe UV shoe sanitizer. With the right care, diabetic foot issues doesn’t have to bring a person down. Thank you for sharing this information. I have spent quite a bit of time researching and writing articles on both type 1 and type 2 diabetes. However, my working knowledge of how these diseases can affect the feet is admittedly limited. Additionally, I was shocked to see that such a large proportion of amputees pass away within five years following their operation. That stat shocked us as well! It wasn’t clear whether the loss of morale due to losing a limb contributed to the quick demise of these patients or if loss of limbs is one of the later stages of decline in the diabetic’s condition. Either way, it is very sad and we’re glad we could develop a product that can help in the fight to prevent amputations. Thanks for reading, Stephen!